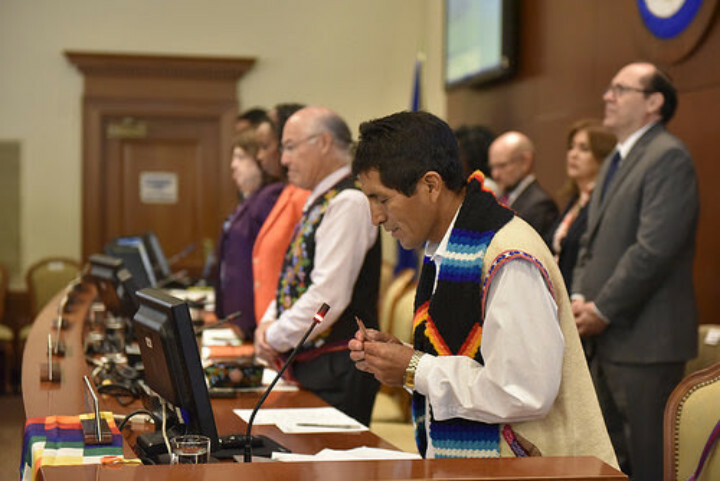 The Permanent Council of the Organization of American States (OAS) today commemorated the First Inter-American Week of Indigenous Peoples, with the participation of representatives of the indigenous peoples of the entire region. The Chair of the Permanent Council and Permanent Representative of Costa Rica to the OAS, Rita Hernández, highlighted the struggle of indigenous peoples for the recognition of their rights, and the steps taken by the OAS in this area. "This commitment has been consolidated with the adoption of the American Declaration on the Rights of Indigenous in 2016 and the adoption of the Plan of Action in 2017," said Hernández. For his part, the Assistant Secretary General of the OAS, Nestor Mendez, explained the efforts of the Organization to put into practice the entire reach of the Declaration that recognizes the right to self-determination and cultural diversity of the indigenous people. After recalling that the OAS has promoted the dissemination of the Declaration in its four official languages - English, Spanish, French and Portuguese - he called on the countries of the region and indigenous organizations to "translate the American Declaration into the greatest number possible of indigenous languages of the hemisphere." The leaders of indigenous peoples of the Americas who participated in the Council meeting were: June Lorenzo, Indigenous Representative for North America in the negotiations on the American Declaration on the Rights of Indigenous Peoples (United States); Clément Chartier, President of the Métis Nation and of the American Council of Indigenous Peoples (Canada); Hector Huertas, Indigenous Representative for Central America in the negotiations on the American Declaration on the Rights of Indigenous Peoples (Panama) and Hugo Tacuri, Confederation of Indigenous Nationalities of Peru (CONAIP) (Peru). Álvaro Botero, representative of the Inter-American Commission on Human Rights (CIDH) also participated.